Members of SAC ready to ring the victory bell at the 2016 Homecoming football game. 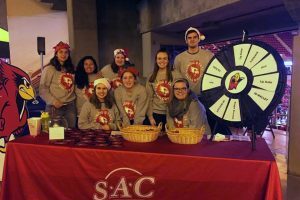 Hear from current Student Alumni Council leadership what has been the big things happening with SAC this year. What wonderful leadership they all bring to the organization! This year has been an eventful and prosperous one for Student Alumni Council (SAC). Our fantastic members have put in so much effort to make our events truly amazing. Homecoming, which is always a SAC favorite, was especially great because of our float winning third place and our second consecutive year ringing the victory bell! It always feels special to get the best seat in the house. We have also been able to raise funds and host events throughout the year to get SAC on the Illinois State radar. Our retreats have made us better leaders and a better team overall, an important part of any organization. I couldn’t be prouder of our members, and I am grateful to have spent the year planning, networking, and growing with them. I hope you enjoy the snapshot of our past year as much as we enjoyed experiencing it. This recruitment season we had the amazing opportunity of collaborating with the ISU hockey team for a recruitment event. We had an open skate night that paired with a hockey game right after. It was so much fun to work with and get to know another organization. I think collaboration is SAC’s next big project when it comes to recruitment. Our Homecoming recruitment turned out really well, as we got people to join just from coming to float building! We found the best way people got to know SAC was working with current members on projects. All in all, we have an awesome group of members, and I am so happy they chose to stay with us. 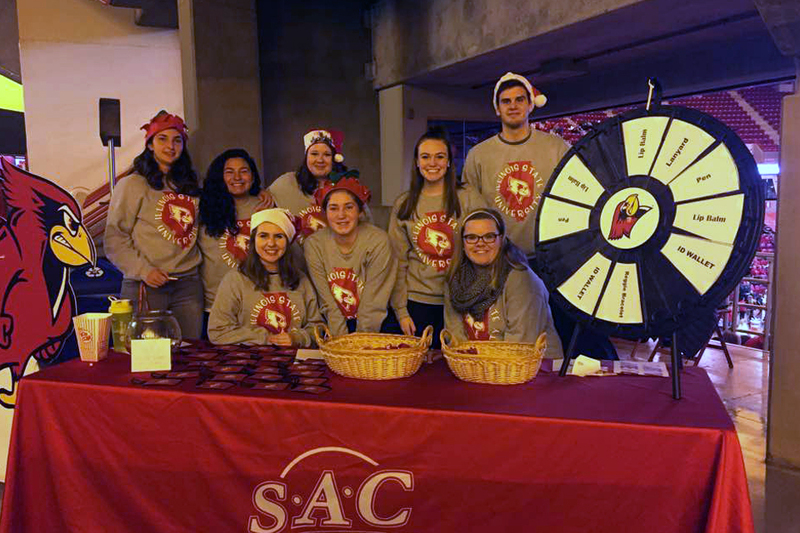 Student Alumni Council member set up a recruitment table at a men’s basketball game. SAC has continued to create opportunities for Illinois State University students to engage with alumni. In fall, SAC partnered with the Career Center and hosted Networking 101 for over 70 students. This free event taught students how to network and then gave them the opportunity to network with alumni. 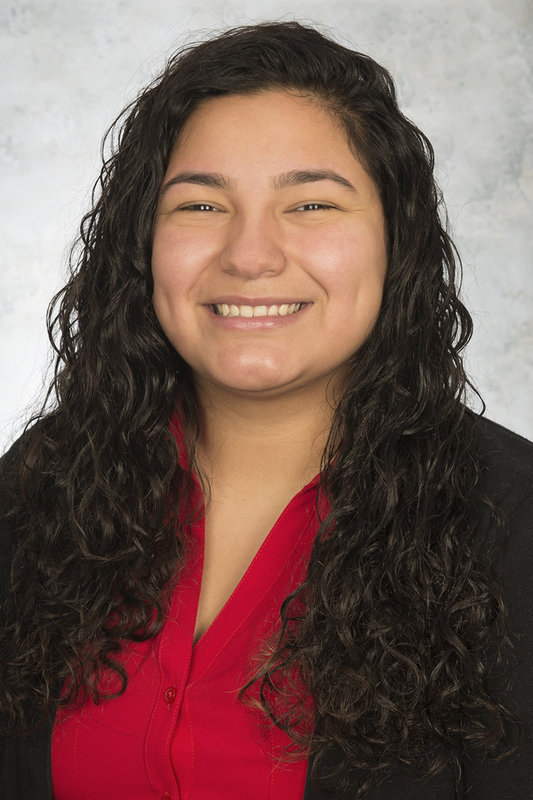 Students even walked away with a professional headshot to use on their LinkedIn profile. This year also opened up some new volunteer opportunities for SAC and the Central Illinois Young Alumni Network (CIYAN). Most recently, SAC paired with members from the CIYAN to volunteer at the Michael Collins 5K that took place at the Corn Crib in Normal. Michael Collins was an ISU student who was killed in a drunk driving accident. The 5K was on April 22 and raised money to help support the Michael Collins Foundations which awards scholarships to both Heartland and Illinois State University students. SAC and CIYAN were proud to help out and give back to this cause that hits home to so many on campus.